Ages late on this one. I am going to try something a little different with this feedback and do it visually with some of the reasoning Spoiltchild uses when approaching a UI design and selling a site. 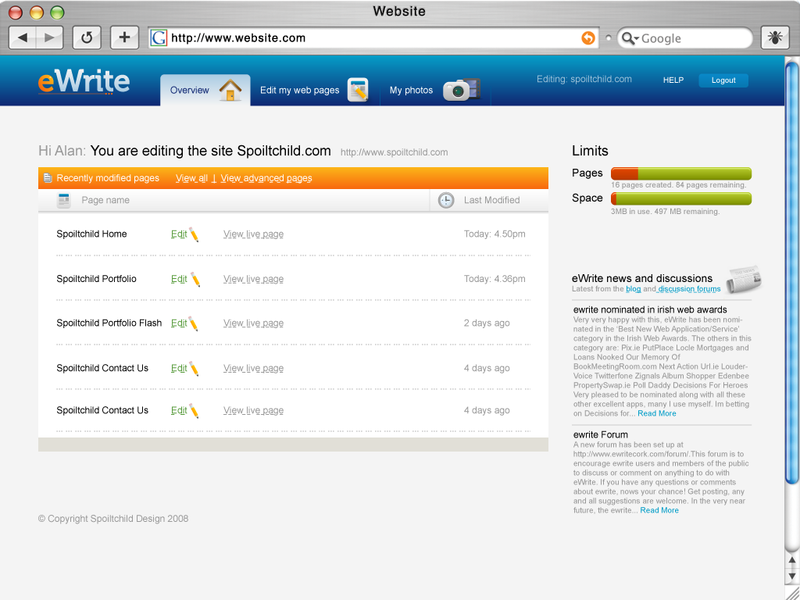 eWrite is a simple web based tool that lets you edit the content on your own website. And thatâ€™s it. Did you need something more? It does exactly what it says on the tin. Give the demo a try. Log in to eWrite, give it the address of your website, choose from the list of your web pages which one to edit and then you are presented something similar to a Microsoft word page where you can edit your content. It costs 200 euro for the year which is worth it but may be a hard sell in its current form. More on that later. Start marketing inside your product. 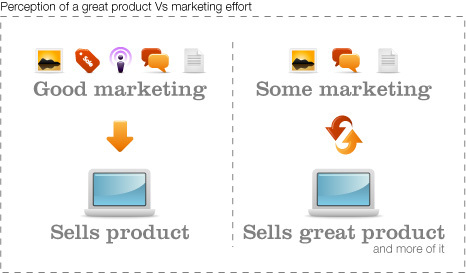 Marketing and selling a product does not start and end outside your product. The traditional thinking is advertise, talk about your product and even now the push is to engage with your potential customers in social media such as Social networks, blogs and forums. The goal being to get customers to try your product. Thatâ€™s great so far but it is only half the battle. You have to Sell to them when they are in the product. Make them think they are brilliant that they find your app so easy to use (they are brilliant, they bought your product didnâ€™t they) Let them feel powerful and in control of this technology lark by allowing them to always know where they are, what they are doing and what to do next. Make it look and feel easy to them. And if they do have any difficulty make it easy to find you, explain their problem and get a solution. This is the part of the marketing loop that you have complete control over, doesnâ€™t keep costing as time goes on. Once a user has found a great product that makes them feel great, they will tell their friends. People love sharing great products and services to others. It makes the look smart, helpful and generous. So while the list of functions might include stuff like Import web page, text formatting, image uploading etc. At the top of that list needs to be “Makes user look and feel smart”. Good marketing helps sell your product. Great product helps sell your marketing. Without this you have twice the fight and 4 times the expense in marketing your product. Marketing within your product is actually remarkably easy and its a one time job of which the benefits far outweigh the little effort. I am a big fan of Seth Godin as you can guess and his book on this subject “Purple Cow“ is a must read for anyone building and selling a product. So back to eWrite. While it is a great, really simple tool that does exactly what it says. It looks like a developer made it. It looks functional. It is missing the marketing within the product that will make it easier to sell. Its all good and fine talking about it so I am going to put my time where my mouth is. I am going to take one of the pages from the application and do a bit of reworking to the style and UI. As you will see functionally it does exactly the same but it becomes a much easier sell and a product a customer will find much easier sell to friends and colleagues. This is the current dashboard screen of eWrite. Makes it look like a really technical dry product. Which it is not. And it is not how it is being sold. Texty, gray, unorganised = Difficult and technical. With all the colours available in the colour pallet why choose gray. I do know why. It is a neutral colour. An easy inoffensive choice that no one could ever have a problem with. But as you see neutral and inoffensive is very hard to sell. Whatâ€™s more you look like a huge number of other similar neutral and inoffensive products out there. No one wants to blend in. When building our own products within Spoiltchild our design is our easiest, cheapest most effective form of online advertising for our products. And I donâ€™t mean that in an â€œour design is fabulous and pretty ra ra raâ€� way but in a very quantifiable way. Everyone loves lists. The top 10 of this, the very best of that etc. They have been around forever and most likely will always be. This exists for design as anything else. Design gallery websites are a hugely popular version of this. Sites like CSSMania (CSS everything else), Smashing Magazine, FWA etc all boast thousands of visitors daily. Taking CSSMania as an example. A side bar banner would cost 1250$ a month. Our app Finetuna.com was featured for free on the CSS Mania site on 9th of June,08 as an example of good design. Top spot on the home page. As a result it then got featured on a host of similar CSS / gallery sites around the world and picked up and reviewed by individual blogs. We reckon if we had paid for that exposure on those sites alone it would have cost over â‚¬5000. Which is more then it cost to build and host the entire application. We have submitted and got it featured on a whole heap of other sites on top of that. I wrote about this before. Now traffic like that is great and ideally targeted for a product like Finetuna. But it they are not your target market they still generate huge link love to help your page rankings. Its a great initial boost and sticks around for the long tail. So its worth spending a bit of time on the design. Below is a small bit of time I spent on the dashboard screen. Followed by some of my reasoning behind each change. Click to view larger. Frame removed. There was no need for this to take up screen real estate and the Photoshop bevel made it look dated. More colour added to make it appear easier, lighter and friendlier. This scheme taken from their new logo. The logo. eWrite are obviously aware of what can be improved within the design as they already commissioned this logo. Terminology and Icons. I adjusted some of the terminology used within the interface to make it more accessible to a non techy user. Added written and visual cues to let a user know where they are and what they can do next. The resource limits of the account were previously at the bottom of the screen. This makes sense if you are a new user and have hardly used any. But as a user approaches the limits its importance grows so I thought it best to make a user aware of their status from the get go. I de prioritised the news section. On the original it seems like it has equal billing to the actual application which is certainly not the case. I would even suggest a way to hide the new after it has been read. Overall more attractive, better spacing, more friendly. LOOKS easier to use. I believe it targets the core market better and makes it easier to sell. 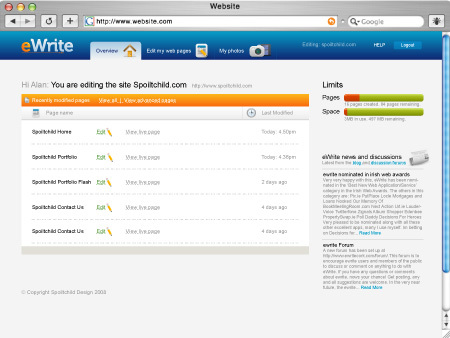 Would you be more tempted to click TRY at http://www.ewritecork.com/ if you seen screens like this? Thatâ€™s the application itself. The home screen also needs to be looked at. Gordon can correct me if I am wrong but the space I see eWrite targeting means it is sitting alongside the following companies and products. Not by functionality but by target user. A simple side by side comparison shows how the home page compares to the competition. Its difficult for a start up to hire design expertise if they donâ€™t have it in house. This is not to be an advert to hire a designer but as you can see above it can more then pay for itself if you do. However, there are lots alternative options out there. This is where I use the dirty word that gets hate stares from designers. Templates. In the last few years templates have come on in quality that they really are a viable option now. And while I donâ€™t suggest using them exactly as given, use them as a starting point. Once you apply your own branding and content needs on them they should end up suitably changed that they donâ€™t look the same as everyone else and you are displaying your information clearly. * Just a note that a redesign like this is just a starting point. To make it truly effective you need to test it, measure, tweak it, test it, tweak it …. Thanks for a great post. Thank you also for taking the time to think about eWrite like this, theres plenty to learn from it. Nice post and very valid points but the companies you mention all are very different. 2) Omniserve.ie – This is the holding your hand service where they build your website but provide you the ability like eWrite to manage it your self. 3) Both SiteKreator and Weebly are very much the DIY approach. They are nice applications but your on your own with them. I also agree though that while there are 100s of Irish ‘web design’ companies but the knowledge and design capabilities differ very much. Guys like yourself obviously know how to design and how to portray products, offers etc. Thats invaluable but it all comes down to what you can afford. Hi Ian, Thanks for commenting. I agree that the companies mentioned are different my point was that they are targeting a similar type of target market and how they do that should be looked at. I am not sure I understand your last point. Can you clarify? Sure I just meant that building a website isnt just about design and how it looks its also about placement of items, how things are said, and how you say them. I probably rambled a little too much. Sorry. What I was just pointing out was that yes there is a range of options for customers based on their budget, technical skills and awareness of marketing and advantages to having a website. The sites you mention cover one spectrum but that the likes of yourself cover the other and where the value in that was.